Hitting kickers is fun but usually someone has to build them. Cliffs are nature’s kickers provided for us work free. However, hucking a cliff is slightly different than hitting a kicker, even if some skiers can do flips off either. Before you attempt the 100-footter in the latest TGR film, practice your skills on a smaller drop, like a rock 5 to 7 feet high. Scope the landing and entry point. Notice any other rocks or trees in your intended landing and run-out-zone. Is it a flat landing, or will you pick up speed on impact and have to ski out? As you move up in cliff heights, be sure you look at the cliff from all angles, below and above, looking for your entry points, obstacles, danger zones and of course, the landing. If you are jumping out-of-bounds, know the snow and slope conditions in relation to avalanche danger. It is likely that you will fall when trying to land your first drop. So be it. Knowing how to fall properly, however, will save your body for future limit pushing endeavors. The art to falling involves becoming limp and going with the crash, rather than fighting it. Recover quickly getting back on top of your skis as fast as you can. For your first cliff, at least, choose a drop with a clear run-out-zone. 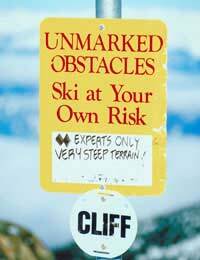 With the cliff or rock scouted and fall perfected, take a deep breath and ski forward being conscious of your three-point balanced stance (see Take Off and Landing) as you slide or jump off the edge. Keep your eyes open, hands up and weight forward. As you leave earth waiting for gravity to pull you back, push your hands toward your landing and tuck your knees up toward your chest. This solid position will help you maintain your balance and stop wind resistance from pushing you back. To land on your skis extend your legs just as you would when landing a kicker, absorbing the impact on landing. Never land any jump or cliff stiff legged. To hip check, twist your skis to the side of slope as you drop, keeping your hands up and body facing forward. Extend your legs, and land feet first dropping to your hip and rebounding up back onto your skis. This speed check maneuver will position you for whatever style turn you need. Breathe again and enjoy the adrenaline rush. The first time maybe the scariest, but it never gets easy; if it were we wouldn’t do it. Know how you want to land as well as where you want to land before you leave the cliff’s edge. Some landings are soft enough and either too steep, obstacle packed or dangerous to ski out, in these instances landing on your hip may be the best option. Avoid flat landings as much as possible, the jarring of your joints will shorten you skiing career. Some cliffs require forward momentum to clear the whole rock. You should have noticed this when scouting the cliff. Start further away from the entry point to build up the proper amount of speed. Be careful not to go too fast and over shoot your landing. Remember always to keep your hands forward, even in hip landings you should not be in the back seat. Hucking cliffs arouse an unmatchable adrenaline rush no matter the height. Start small and move up as you become comfortable. If you find yourself landing in the back seat more often than not, go back to a little rock and practice your balance and stance.